SoftBank Robotics is known mainly for its robot named Pepper. The semi-humanoid has been interacting with people at places like banks, restaurants and nursing homes. The company is introducing a new robot but this one isn’t much for interacting. Instead, it ignores the small talk and gets straight to work. SoftBank’s latest robot is called the Whiz and it’s an autonomous floor-cleaning machine. All it needs is a human to quickly lead it through the layout of the space that needs cleaning. After that, the Whiz does pretty much everything autonomously. The robot comes equipped with a 3d Camera, laser rangefinder and an array of sensors which help the unit detect obstacles. The bot can detect things like people, steps, pets and any other object that might get in the way. If the Whiz detects something it will either avoid it or pause until the route is clear. 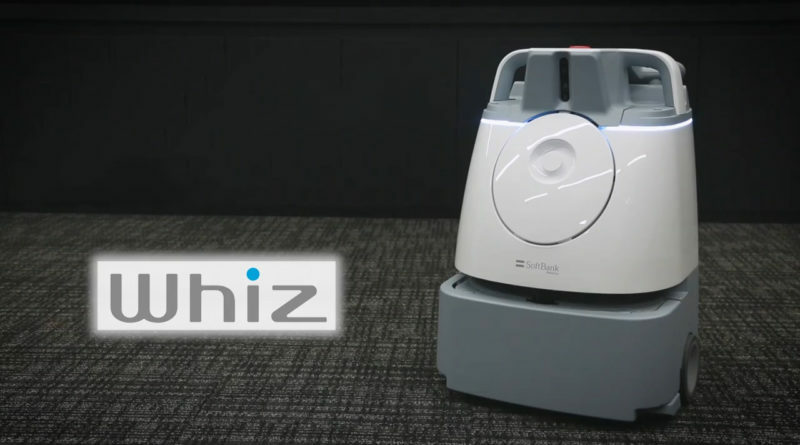 The Whiz can clean over 5,000 square feet per hour and lasts about 3 hours on a single charge. The battery can be upgraded so the robot can clean for even longer. Users can monitor the robot’s progress via an app and can even overtake control in case of an emergency. The 70-pound floor cleaning robot stands at about 2 feet and can move up to 1.5 miles per hour. Recharging the Whiz’s battery takes 5 hours. The robot’s body will use Chinese parts while San Diego-based Brain Corp will be powering the AI. The Whiz will be available to rent starting in 2019 costing around $230 a month for each unit. SoftBank is marketing the autonomous floor-cleaning robot to businesses and feels it can help companies cut costs and combat labor shortages. “SoftBank spends about $1600 a month for a crew to clean its headquarters. Using the Whiz could save the company about $300 a month,” said Kenichi Yoshida, chief business officer at SoftBank Robotics. Check out our article on floor cleaning robots in Walmart and ones that keep patients company in nursing homes.